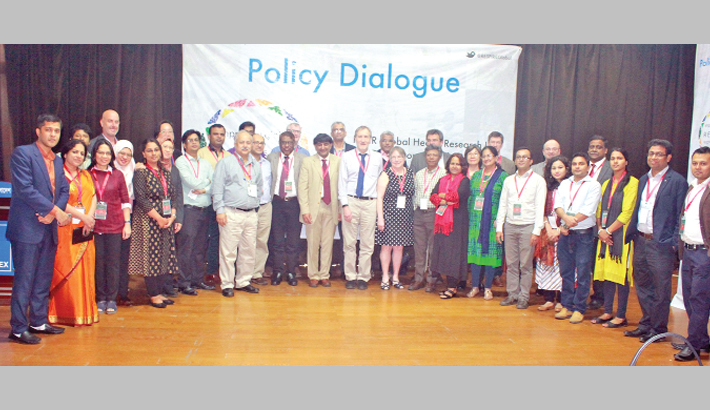 An international policy dialogue meeting on scientific research on respiratory diseases styled ‘RESPIRE’ held in Dhaka recently. Some 20 including 15 foreign researchers on respiratory diseases participated at the three-day meeting of RESPIRE, an initiative led by Edinburgh University to reduce the burden of diseases, at Krishibid Institute and Hotel Serina in the capital. Child Health Research Foundation (CHRF) organized the second meeting of core members of RESPIRE to share academic knowledge on the research on the field. CHRF Executive Director Prof Samir Saha and two academic from University of Edinburgh, Prof Aziz Sheikh, Prof Harry Campbell jointly briefed the media at KIB complex on Wednesday. Prof Samir Saha, head of Department of Microbiology Dhaka Shishu (Child) Hospital, said pneumonia is a major cause of death in children worldwide. In recent years, many countries, including Bangladesh, have reduced the burden of pneumonia using pneumococcal vaccines. Prof Aziz Sheikh said Respiratory diseases are responsible for one in five deaths in South Asia and it is time that we also focus on non-pneumococcal diseases of the respiratory tract. Prof Harry Campbell suggested to refraining from smoking, establishment of safer brick kilns, cooking with alternative fuel can reduce the risk of the disease significantly. United Kingdom government initiated the progamme in August last year and Edinburgh Univ leading the platform with several institutions of Bangladesh, India, Malaysia and Pakistan.